Hint! 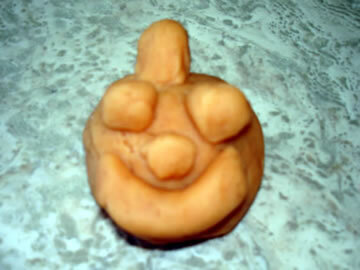 Add pumpkin pie spice to make aroma play dough. "BAT WAIT" - THERE'S MORE! Yesterday was about spiders, "bat" today you'll find more ideas of things to do with a bag of plastic bat rings. You can...sort them, count them, make a pattern, and "play" with math standards. Make a cave from a disposable bowl by turning it upside down and cutting an arch as shown. Display a certain number of bats. Put some in the cave and ask children, "How many do you see? How many do you think are in the cave?" Several years ago we were eating in a Mexican restaurant in October and there were little Halloween toys in the spice bottles. It was interesting to watch adults, children, and families at every table trying to identify the objects. I guarantee this bottle will capture your students' interest! You will need a clear plastic bottle or jar, salt or sand, and small seasonal toys. Fill the container 2/3 full with salt or sand. Insert the toys and then screw on the top. Shake. *How many objects can the children find? 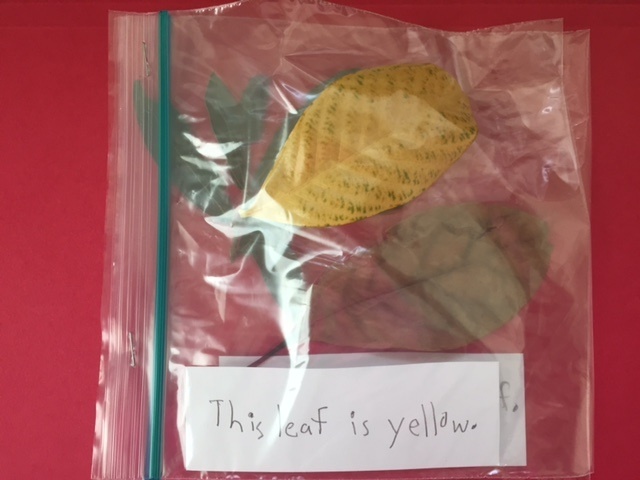 *Pass around the bottle and let each child make a complete sentence starting with "I spy a..."
*Have each child repeat what the previous child says and then add something they see. First child: I spy a spider. Second child: I spy a spider and a bat. Third child: I spy a spider and a bat and a cat. *Ask younger children to draw what they see in the bottle. *Have older students make a list of everything they find in the bottle. 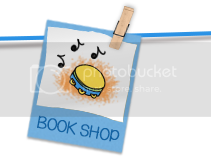 *Can they write a story using the objects in the bottle? *Use the bottle to reward children who are working quietly or children who are resting quietly. Make bottles for different skills or themes. You might fill a bottle with geometric shapes, magnetic letters, different colors of crayons, sight words written on cardboard, etc. Spiders are a good substitute for scary things this time of year. These plastic rings are cheap, plentiful, and perfect for hands-on activities. 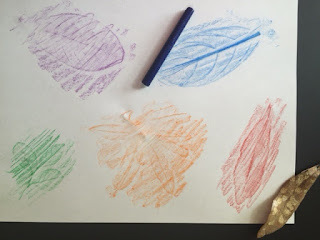 Trace around children’s hands and feet on white paper. 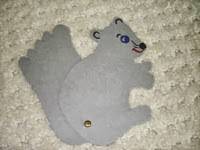 Glue to black construction paper and let children add details. Cut ghost shapes out of white paper. Write letters, numerals, words, or whatever skill you want to reinforce on the ghosts. 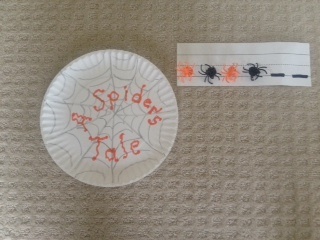 Staple ghosts to a bulletin board and let the children identify the information as they swat the ghosts with a fly swatter. Halloween is a good time to talk about things that are real and things that are pretend. It’s also helpful to talk about things that scare us. I always talk about things that scare me, and that usually encourages the children to open up and talk about things that scare them. Everybody’s afraid of something, and that’s O.K. 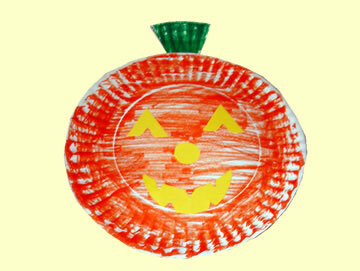 Make a class book called “Scary Things” where each child draws their fears and dictates or writes a story about them. It’s Johnny Appleseed’s birthday today, but you can use this finger play and story any day. Johnny (John Chapman) is remembered for planting apple trees throughout Ohio, Indiana, and Illinois. He was well known and liked for his kindness and generosity, so say “cheers” to him today by eating an apple. You can also give him a “cheer” with this finger play. 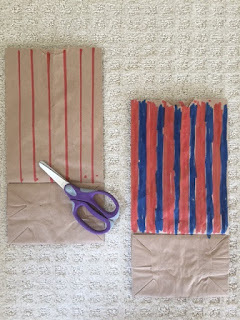 Make a flannel board from a file folder to use as a follow up for this rhyme. And, here’s a story that I bet Johnny would have loved. Directions: Put the apple and knife in the bag and have it on your lap as you begin to tell the story below. 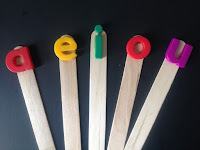 Insert children’s names in your classroom to capture their interest. Grandpa laughed, “Well, I have the answer to your riddle right here in my sack.” And he pulled out an apple. (Pull the apple from your sack.) 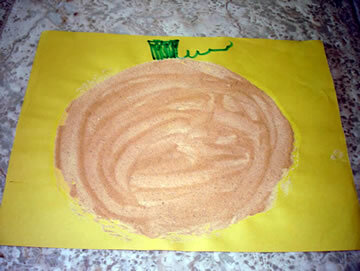 The children said, “How does that solve our riddle?” Grandpa said, “This apple is like a little red house. 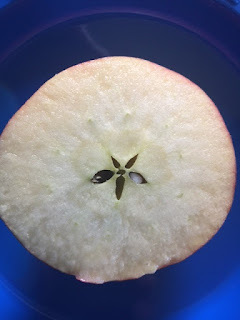 See, it’s round and the stem is like a chimney.” “But where’s the star?” wondered the children. Grandpa took a knife and sliced the apple in half. (Take the knife and slice the apple in half diagonally.) “And here’s the star!” The children were amazed to see that sure enough, there was a star in the middle. I must have told this story thousands of times over the past 40 years. The wonderful thing is that it's "old" to me, but most of the teachers and children have never heard it before. You'll need to practice a few times before doing it for your class, but I guarantee you'll hear, "Do it again! Do it again!" Once there was a little old lady who lived in a funny orange house near name of your school. Her house was shaped like half a circle with the chimney at the bottom. This little lady had a cat named child’s name in your room. This cat had a long, curved tail, so the old lady had a special door cut just for the cat’s tail. The little lady always wore a pointed hat. She had a special door built for herself, too, so her hat would not fall off every time she went in and out the door. The little lady had two pet birds. Their names were child’sname and child’s name. She had a window cut just for them so they could fly in and out and in and out. It was getting close to Halloween, so all the children inteacher’s name classroom went to her house and knocked on her door. The little lady came to the door and said, “Close your eyes.” SURPRISE! It’s a jack-o-lantern! Here's a link so you can download the directions. And here's the video where you can watch me do yesterday's finger plays and tell the story. One day as she sat there rocking and spinning she heard a knock at the door. “Come in,” she called. In came two big, black boots. (Draw boots on the board.) “I can’t talk to you big, black boots,” said the little old lady. So she just sat there and she'd rock and spin until she heard a knock at the door. “Come in,” she called. And in came two bony legs. (Draw two skinny legs coming out of the boots.) “I can’t talk to two bony legs,” said the little old lady. So she just sat there and rock and spin until she heard a knock at the door. “Come in,” she called. And in came two wiggly arms. (Draw wiggly arms coming off the body.) “I can’t talk to wiggly arms,” said the little old lady. “Come in,” she called. And in came two big hands. (Draw hands at the end of the arms.) “I can’t talk to two big hands,” said the little old lady. “Come in,” she called. And in came a big pumpkin head. (Draw a pumpkin head on the figure.) “Well, I can talk to a pumpkin man,” said the little old lady. And she did! Spiders and pumpkins and black cats - oh, my! Halloween is more than a month away, but over the next few days I'll share some "treats" with you that I've gathered over the years. 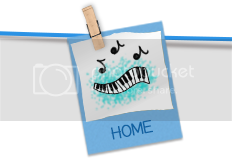 Many of these rhymes and projects are like "lost atifacts" so I hope you'll keep them alive! 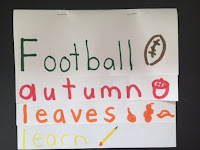 *My students love to hold paper pumpkins and act out this rhyme. 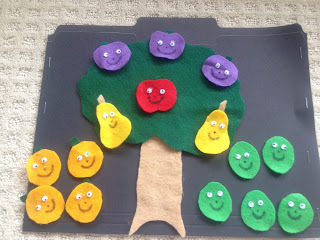 *It's also easy to make a flannel board activity for children to use as they say the rhyme. Here's a youtube video my daughter did several years ago where you can see me demonstrate the finger plays. Tomorrow I'll have more details about the stories on the video. I - We hold our nose for the short sound. O - Arms in a high circle. U - We make our arms make a u with our waist. I have also stepped outside the room and come in as Miss Vowel--think Viola Swamp. The kids love it! 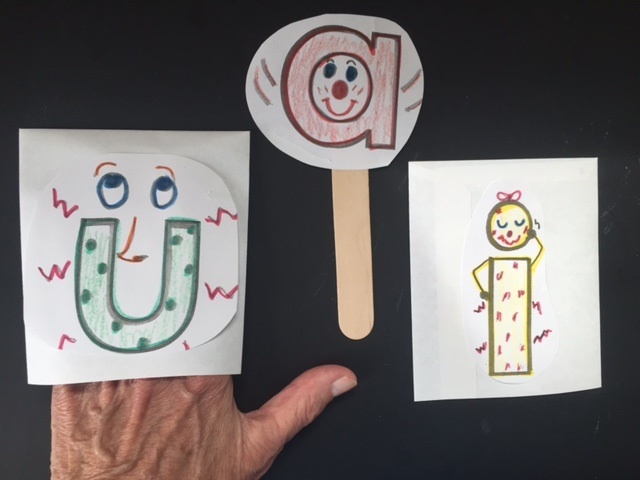 The long vowel sounds are fairly easy for children to remember because "they just say their name." 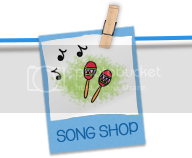 Here's a song that will help put those short vowel sounds in the brain. Of course, the letter U will be their favorite! Note! 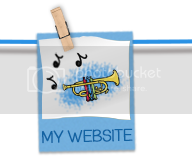 I'll sing a sample verse, but when I make movies that are too long blogger doesn't like it! And she would always sneeze-o. And she would always itch-o. And this is what he’d say-o. Hint! When sounding out words, make the motions for the above vowels to prompt the children. 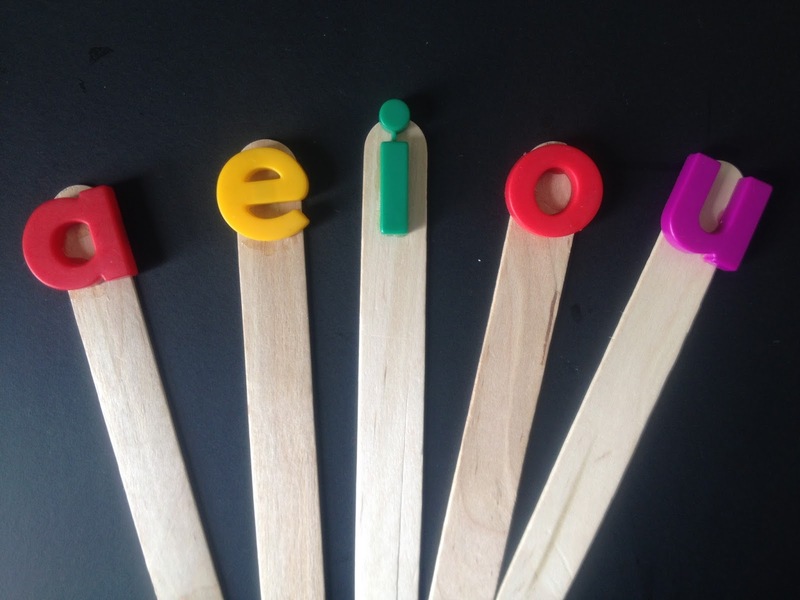 Glue magnetic letters to craft sticks and hold up as you sing the song. 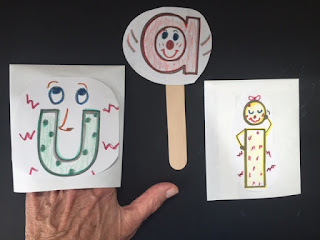 Let the children use the attached sheet to make vowel puppets. Tape the letters to craft sticks or glue to an envelope that's been cut in half. This is absolutely crazy!!! I'm getting phone calls from high school students all over the United States saying, "Dr. Jean, I love your banana dance. It makes me so happy!" One boy even wanted to know when I was going to be on "tour" in California! Seriously! I'm a dinosaur when it comes to social networking, but there are two ways of looking at this. #1 - They are making fun of an old lady singing a silly song. #2 - They want an excuse to sing and dance and be happy little kids again. I'm going to assume it's #2, and I love them for that! Someone asked me again yesterday, "When are you going to retire?" My response was, "I hope never. I'm still having fun! How many people my age get to sing and dance with five year olds?" 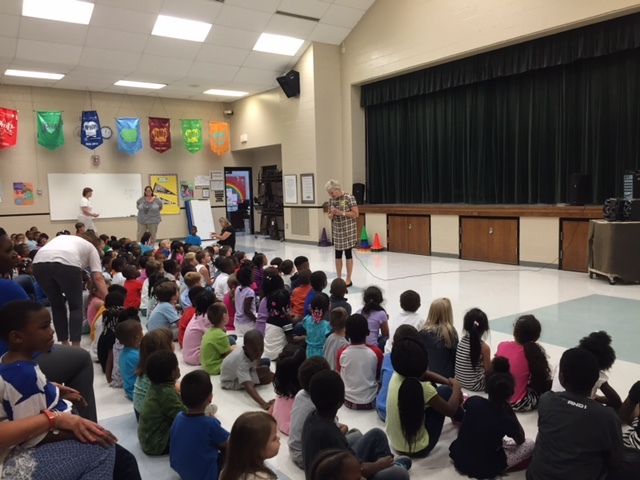 Monday I did two free concerts at schools in Charleston and those little children filled my heart with JOY! How blessed am I to still be able to make a child smile? There was a little boy who was deaf and his teacher came up before the concert and wanted me to know about his special needs. I tried doing a little sign language with him (which is as pitiful as my Spanish), but the teacher said that no one had ever taught him sign language until he started school. Well, would you believe that by the time I ended with "The Banana Dance" he was totally engaged and doing the movements. The teacher said he had never responded like that before. That's why I do what I do!!!! So, NO! I'm not retiring because someone still needs to remind the world that children need a childhood. They need to sing and dance and laugh and play - or when they are high school students they are going to need to take a remedial course on "The Banana Dance." Make their sounds, make their sounds. *Continue singing different letters and making their sounds. 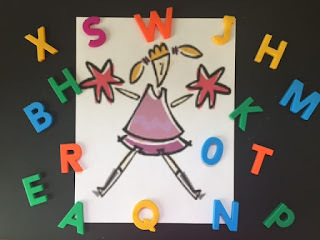 I’m so excited that my webmaster has put up a new video called “Goooo Letters!” This can be a good brain break when your class gets the wiggles, and you’ll be reinforcing standards at the same time. You can pretend to play the drums or twirl your hands and fist bump the letters and sounds. Or, better yet, challenge your students to learn sign language with me. Stand up and here we go!!! Scarecrows and squirrels go together like peanut butter and jelly. And, they are a good seasonal character to focus on if your school does not celebrate holidays. 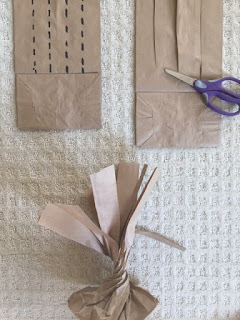 Class Scarecrow – Some old clothes, newspaper, and paper grocery sack will work just fine for a classroom scarecrow. 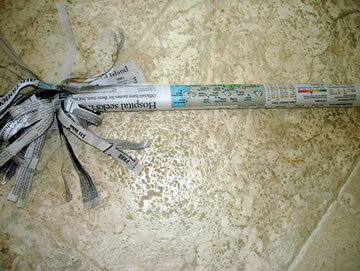 Stuff newspaper in the sack and gather the bottom with a rubber band to make a head. Add a face. Let the children wad up newspaper and stuff the clothes. Sit it up in a chair and prop up the head with a dowel rod. Have the children bring in gloves, a hat, boots, etc. from home to complete the scarecrow. Write stories about the scarecrow. What would you do if you were a scarecrow? 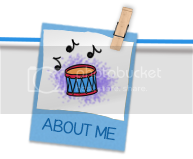 Scarecrow Picture Talk- Download a picture of a scarecrow from the internet. Discuss what a scarecrow does. How many details can children notice about the scarecrow? Draw lines to label their descriptions. 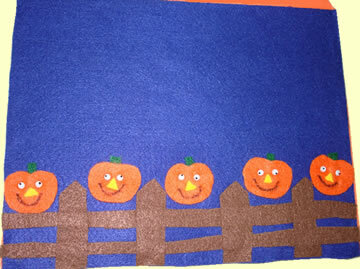 Scarecrow Collage – Give children fabric scraps, construction paper, straw, etc. and invite them to create a scarecrow. What is their scarecrow’s name? 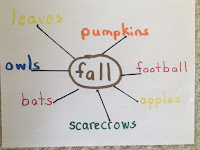 If I Were a Scarecrow... Make a language experience chart where children complete the sentence. Older children could write creative stories about what they would do if they were a scarecrow. Children stand up and stretch out their arms like a scarecrow. They repeat each line as they make the appropriate movements. Can you turn around? I can turn around. Can you touch the ground? I can touch the ground. Can you wave up high? Can you let your arms fly? Can you give a clap? Can you give a snap? Can you thump, thump, thump? Can you wiggle your knees? Note! 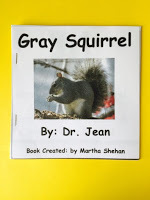 Visit drjean.org and you can download this song and book free. So, the psychologist filled one room with toys and video games and candy. In the other room he asked a local farmer to unload a truck full of manure. He put the pessimistic twin in the room with the toys and the optimistic twin in the room with the manure. 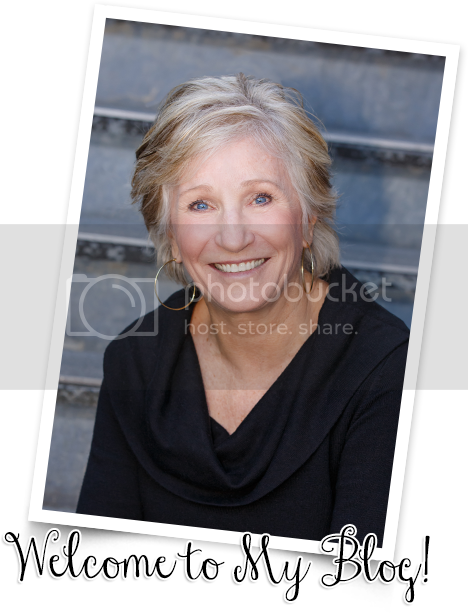 Tomorrow is World Gratitude Day, and I thought this was the perfect story to share with you. With all the paperwork, and assessments, and standards, and expectations in your job, there’s GOT TO BE A PONY SOME PLACE!!! It’s not easy, but look for the joy every day, and give children a little joy every day. Having YOU for a teacher might be the best thing that happens to some child! P.S. 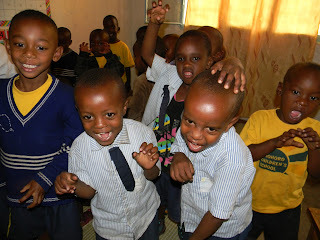 My Friend Jane Bond who runs the Amahoro School in Rawanda sent these photos of her children doing "Dinosaur Boogie." This is my pony! GIVE A CHEER FOR GAME DAY! It’s another big football Saturday and you’ll never guess where I am! Give up? I’m in South Bend, Indiana, to watch the Georgia Tech vs. Notre Dame football game. My husband is a crazy Yellow Jacket fan and going to a Notre Dame game has always been on his bucket list. Now, we’ll be able to check that one off! 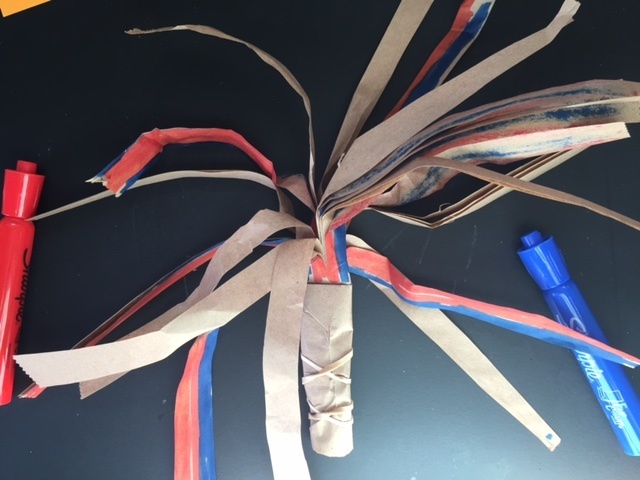 I’m not sure I’ll take these pompoms to the game today, but your students are bound to enjoy making…and I’ll even give you a few ideas for tying them into standards. One more for you Alphabet Hot Potato - each time they hold the ball say 1-3 letters of the alphabet. The child chooses. Who ever had the ball when you get to the letter Z has to get up and ZOOM (run) around the circle. So child #1 says A,B,C and passes the ball - child #2 says D,E and passes the ball - child #3 says F,G,H and so on until you get to Z. Just remember no one can say more than three letters while they hold the ball. Hint! 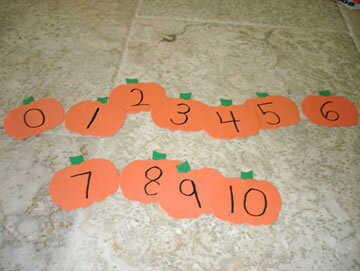 You could also do this with counting. Every time you get to a multiple of five or ten that child has to sit down. 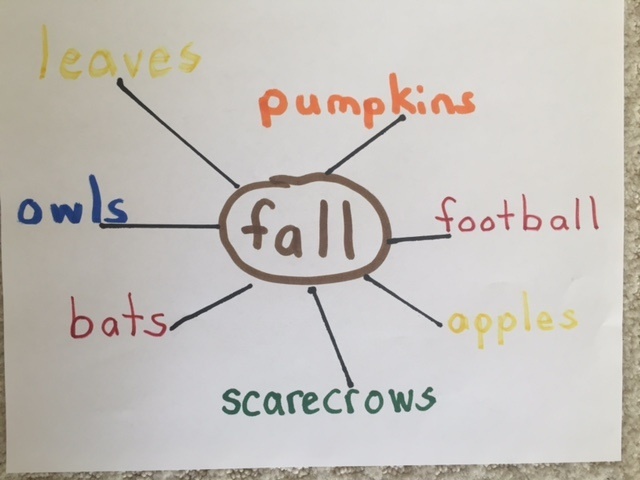 Here's a simple craft activity that you can tie into science (seasons), reading (letters and word families), and writing. It's good for small motor skills as well as cutting. Directions: Tear or cut 3 or 4 strips half way down from the top of the bag as shown. (You might want to draw these lines for younger children.) Open the bag and twist in the middle to make a tree. 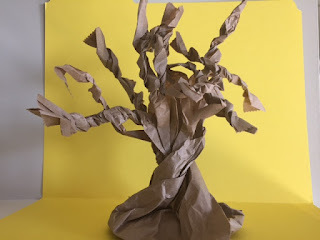 *Tear red, yellow, and orange scrap paper and glue them on the strips to make an autumn tree. 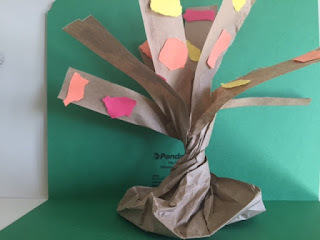 *Pink and white tissue paper can be waded up to make blossoms on a spring tree. 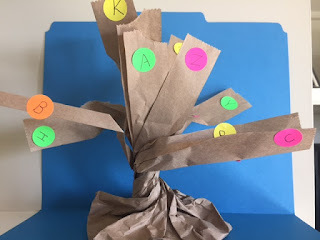 *Write letters (or use letter stickers) to make a "chicka chicka boom boom boom" tree. *Make a word family tree by writing all the words they can make from a specific rime. *Let children make a family tree by writing names of family members on their tree. 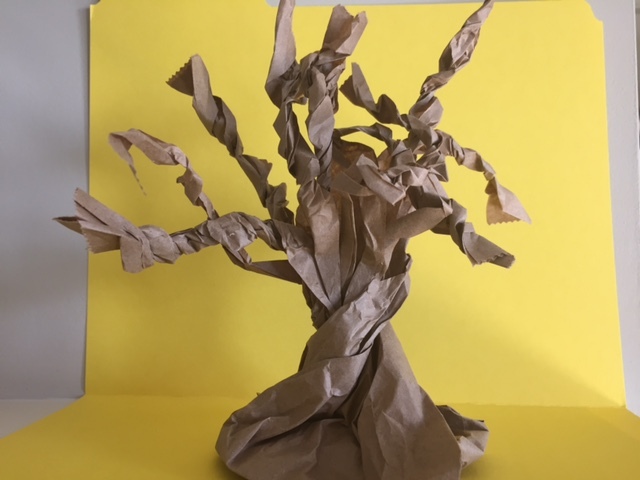 Twist the strips of paper as shown to make a spooky tree. Let children cut bats, cats, and other spooky things to go on their tree. *Use these trees to prompt descriptive writing or poems. Note! If you're entertaining this fall here's a centerpiece will get rave reviews. All you need is a large paper grocery sack. Wad and crush the sack until it is soft and pliable. Next, make a large tree using the same process you did for the lunch bag. Use silk leaves, small pumpkins, and other seasonal objects to decorate your tree. Taaa daaa!! The first day of fall is Wednesday, September 23rd. Here some activities you might want to include in your lesson plans next week to help you celebrate! 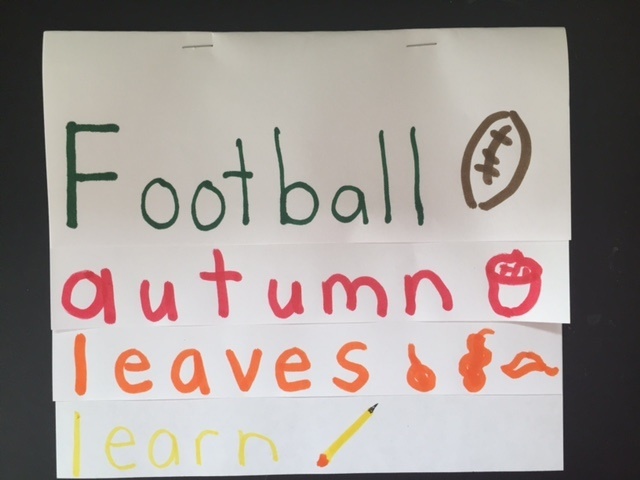 Let children dictate sentences about why they like autumn. *You could also make a step book where they write seasonal words for each letter. Whoever heard of Make a Hat Day? 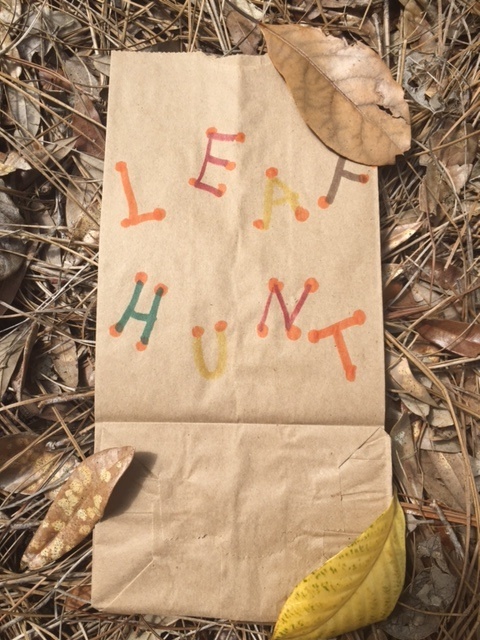 Well, it’s today, but here is a simple hat idea that you can adapt for letters, shapes, or other skills any old day. 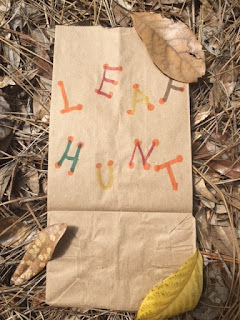 Directions: Let children choose a favorite letter and write it in the middle of the strip of paper. Have them decorate the strip with pictures of things that begin with that sound. Adjust the headband to the child’s head and staple. 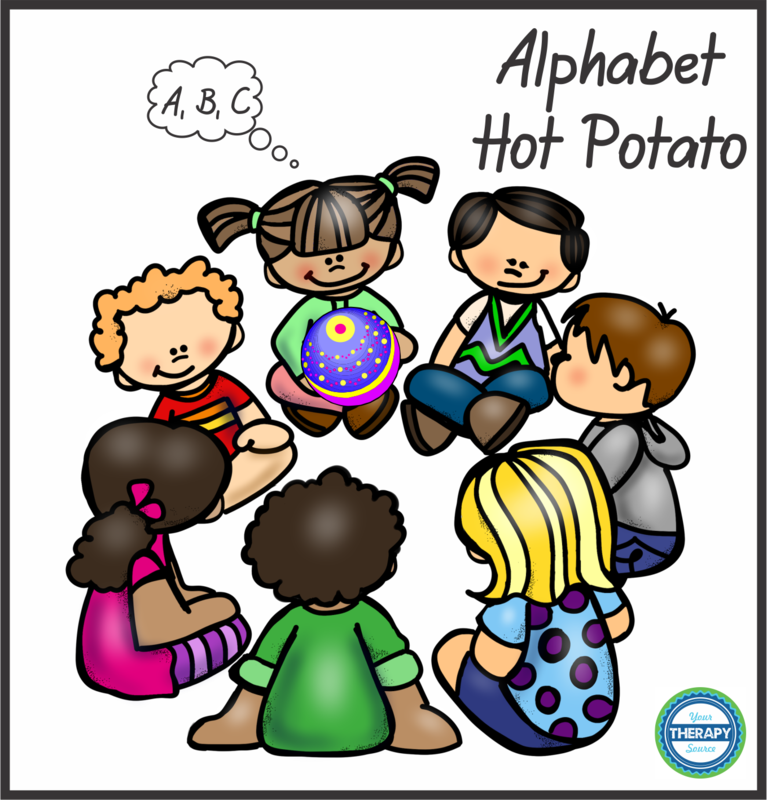 *Sing alphabet songs and let the children do a special dance when their letter is sung. 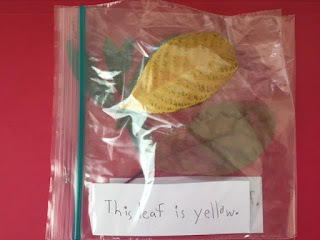 *Call out three (CVC) sounds and let children come to the front of the room if their letter makes the sound. Have the children hold hands to make the word. 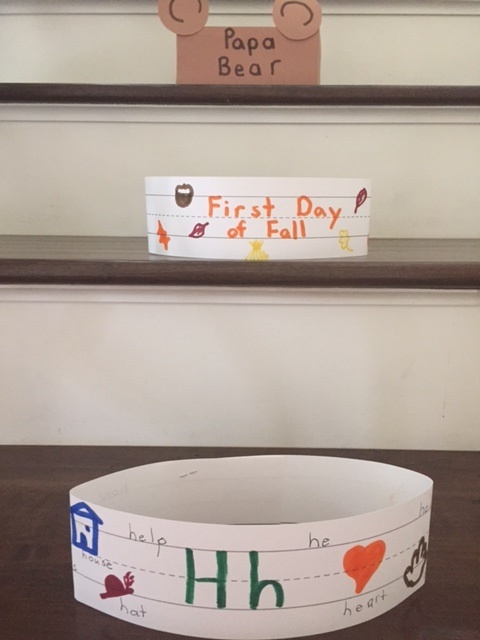 Instead of book reports, let students make headbands about their book and then do a book talk. Let children make shape headbands but cutting out construction paper shapes and gluing them to their headband. 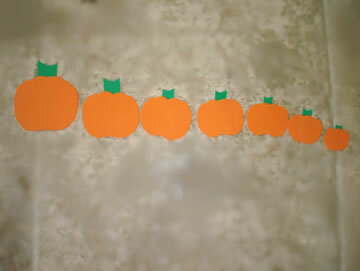 Make headbands for Thanksgiving, Valentine's or to celebrate other special days. Decorate headbands for characters from a story. Children can wear these and act out the story. A - B - C AND THEN SOME!